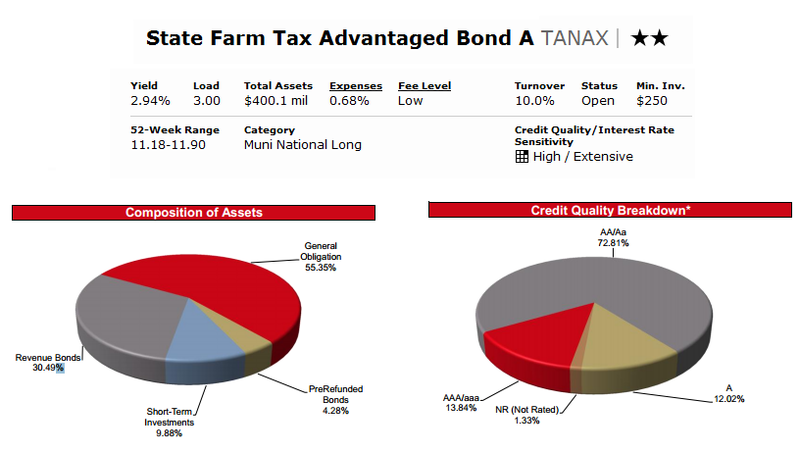 State Farm Tax Advantaged Bond A (TANAX) fund is a municipal bond mutual fund. It provides tax free income for investors by investing in a diversified portfolio of muni bonds. You can find the fund review below. The investment aim of State Farm Tax Advantaged Bond fund is to seek a high income rate exempt from federal income taxes with prudent investment management. The fund utilizes its asset to invest in a diversified selection of municipal bonds. The fund may hold bonds with maturities of 1 to 30 years. Duncan Funk is the State Farm fund manager. It has total net assets of $400.11 million. This fund has 12-month dividend yield of 2.94%. The most recent dividend was distributed in April 29, 2012 in the amount of $0.03. It has low annual holdings turnover of 10% (data as of May 16, 2012). There is a management fee of 0.25% and front-end sales load of 3.00%. The annual expense ratio is 0.68%. You can buy this muni bond fund with a minimum initial investment of $250. If you are looking for long-term growth of capital or wanting the greater growth potential of an investment, you may not want to invest in this fund. The other classes of this fund are Legacy Class A (STFAX), Legacy Class B (STFBX) and Class B (TANBX). The expense ratio for the Class B fund is 1.09%. As of March 2012, the composition of its assets is General Obligation (55.35%), Revenue Bonds (30.49%), Short-Term Investments (9.88%) and Pre-Refunded Bonds (4.28%). It has total of 249 securities as of first quarter of 2012. Principal risk of investing in this municipal bond fund include: Interest rate risk, Income risk, Credit risk, Management risk, Liquidity risk, Municipal bond risk, etc.